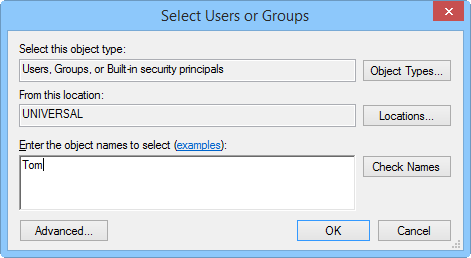 Starting with Windows Vista, admin users are not the same as previously. Now being an admin user does not grant you the privilege to change files on your local drives! By default, you can change files only in your home directory, just like users with restricted access rights. Changing files in other directories requires elevation, which is not always possible. So you may find out that some desired features in various applications do not work. You can fix the problem by adding permissions to certain files or folders. On the screenshot above, we can see that all users ("Everyone") have permissions to read and execute files in our folders, but no write permission is granted. This is a reasonable precaution, as otherwise any person that uses your computer (under a different user account) will be able to change or delete your files. If you are the only person who uses the computer, you can add a permission to write to "Everyone". However, we can do something different instead. Again, click "OK" to apply the changes and close the window. Now all applications that you run yourself will have necessary access to work with your files. No other users will be able to change or delete the files.